Let’s be honest, functional furniture is not always aesthetic. Nonetheless, the TEEbooks shelves prove that you can easily combine beauty and practicality. The subtlety and discretion of TEEbooks storage also apply to wall mounted DVD storage. With perfect dimensions, they fully adapt to your walls and don’t require any specific set up. These shelves being modular means you will be able to lay out your home as you wish. You thus will be able to sort out at leisure your favourite films by theme, producer or actor. You can choose your number of shelves according to how many DVD’s you have, this will ensure you don’t have long empty shelves and you will be able to add a media storage shelf if and when the need arises. The TEEbooks wall shelves are ‘à la carte’ all according to your needs. The wall mounted DVD storage are designed just for this. The 15 cm depth ensures a good support for your DVD’s on the shelf. The TEEbooks DVD storage shelves benefit from a refined and discreet design which adapts itself perfectly in all types of interiors, they are discreet enough to blend in any ambience. DVD Storage There are 11 products. 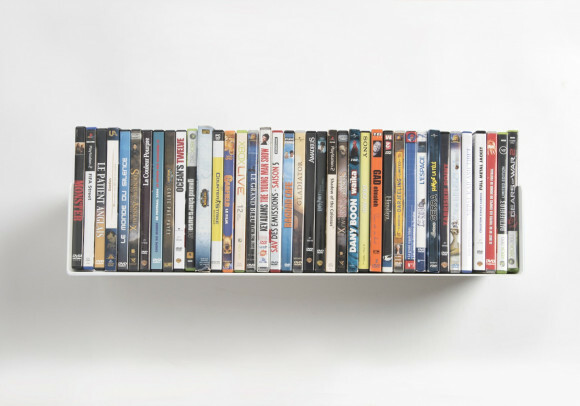 UDVD wall shelf is simple and functional way to store your DVD collection. Characteristics : depth 5,9 inch, height 5,9 inch, length 23,62 inch, weight 7 pounds. Made of 0,07 inch-thick steel Can contain approximately 40 DVDs and holds up to 44 pounds. 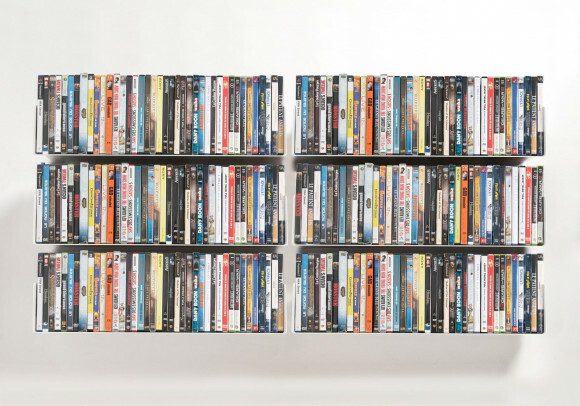 Create your very own DVD shelving system ! 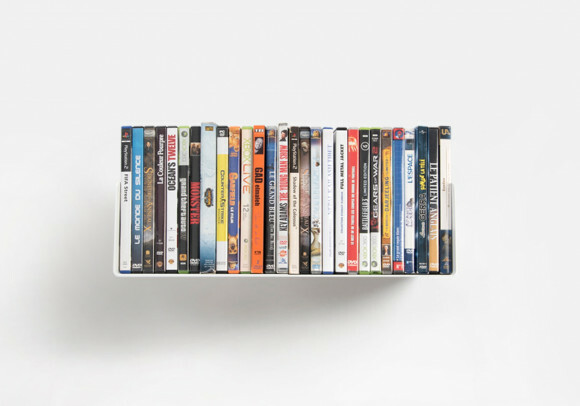 USDVD wall shelf is simple and functional way to store your DVD collection. Characteristics : Depth 5,9 inch, height 5,9 inch, length 17,71 inch, weight 6,17 pounds. Made of 0,07 inch-thick steel Can contain approximately 28 DVDs and holds up to 33 pounds. 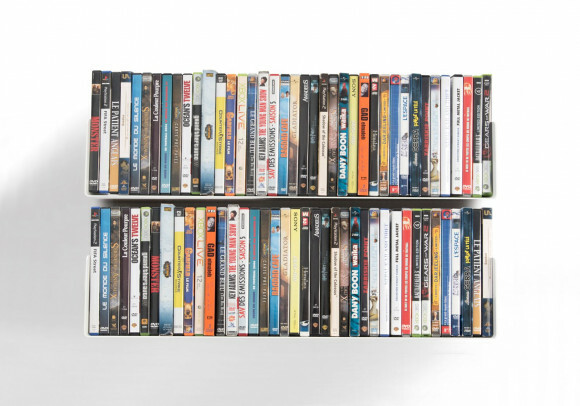 Create your very own DVD shelving system ! DVD shelf "TG" is simple and asymetric shelf to store your DVD collection. 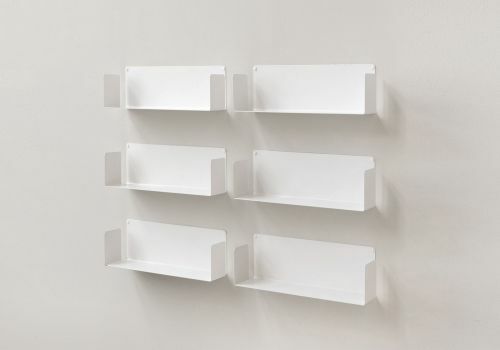 Characteristics of the shelf : 5,9 inch deep, 23,62 inch high and 23,62 inch long, weight 9,48 pounds. Made of 0,07 inch-thick steel The shelf can holds up to 68 DVD ! 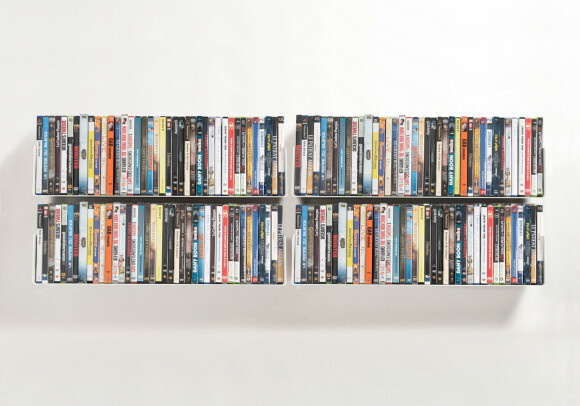 Display your DVDs, CDs, horizontally and/or vertically. DVD shelf "TD" is simple and asymetric shelf to store your DVD collection. Characteristics of the shelf : 5,9 inch deep, 23,62 inch high and 23,62 inch long, weight 9,48 pounds. Made of 0,07 inch-thick steel The shelf can holds up to 68 DVDs ! 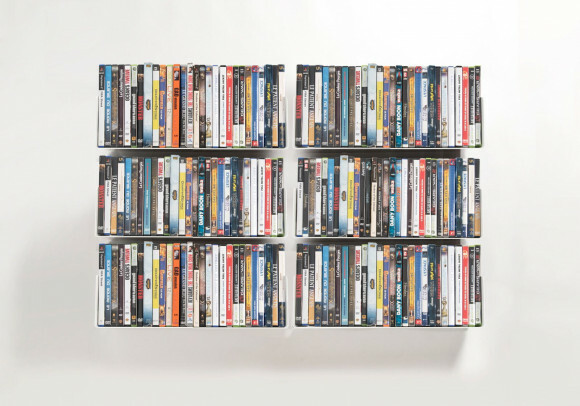 Display your DVDs, CDs, horizontally and/or vertically. DVD shelf "TUS" is simple and fonctionnal shelf to store your DVD collection. Characteristics of the shelf : 5,9 inch deep, 23,62 inch high and 41,3 inch long, weight 15,4 pounds. 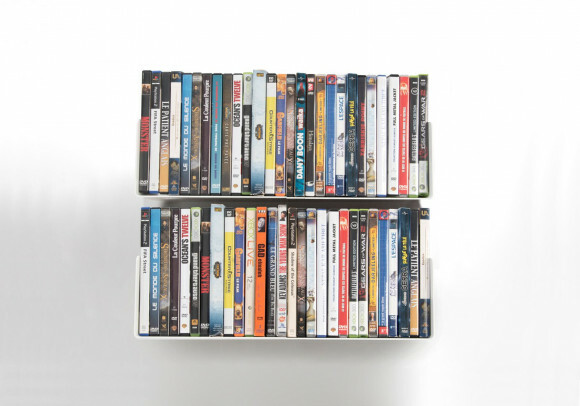 Made of 0,07 inch-thick steel The shelf can holds up to 100 DVDs ! 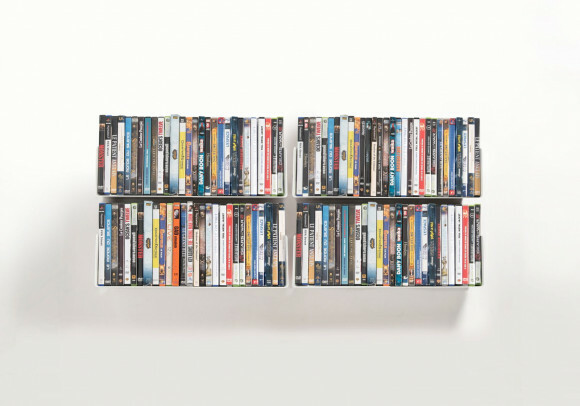 Display your DVDs, CDs, horizontally and/or vertically.